58 countries list English as an official language - but not the UK. The world's lingua franca or second language is not, technically, the 'official' language of its birthplace. The de facto official language of the United Kingdom is English, which is spoken by approximately 59.8 million residents, or 98% of the population, over the age of three. An estimated 700,000 people speak Welsh in the UK, an official language in Wales, and the only de jure official language in any part of the UK. Approximately 1.5 million people in the UK speak Scots—although there is debate as to whether this is a distinct language, or a variety of English. If the vast majority of UK citizens speak English, why is not the official language? The linguistic history of the United Kingdom is complex. Until the 19th century the English language was not seen as a unifying force - majorities in Ireland, Scotland and Wales did not speak it while various kings also struggled. Much of what has become English law originates in 'foreign' documents and the rise to pre-eminence of the language has largely been evolutionary English rather than by legal diktat. In Ireland, for example, mid-19th century mass emigration arising from the potato famine was the key factor in English overtaking Gaelic as the majority language. The teaching through English in schools was another - see here. Were people forced to speak English? English became the primary language of most of the United Kingdom through usage rather than coercion. Unlike in Spain, for example, there was no serious attempt to crush 'home nation' nationalism, through the prohibition of the public use of Welsh or Gaelic. In the late 20th century minority national languages were incorporated into the evolving United Kingdom, following new constitutional arrangements (Welsh and Scottish devolution, The Good Friday Agreement etc.) Welsh is now the official language of the Welsh Assembly (parliament). The Northern Ireland Assembly is currently suspended (largely) because of a linguistic issue: the status of the Irish language. 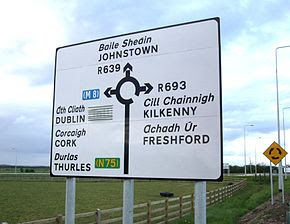 There are bi-lingual road signs in the Republic of Ireland but not in Northern Ireland. England is in a unique - and some have argued disadvantageous - situation. Though by far the biggest nation within the United Kingdom, it has no parliament. It therefore does not have an official language.